Award Winning Chinchilla and Shaded Silver Persians and Exotics. ​WELCOME to CALOOLA SILVERS. 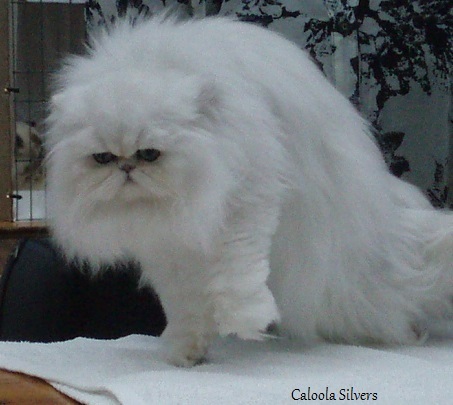 We have been successfully breeding and showing Silver Persians and Exotics since 1987 and are situated in the beautiful countryside of New South Wales to the south of Sydney. I have been President of the Silver Cat Club of Australia for over 21 years and in 2003 both my husband and I were awarded Honorary Life Membership. ​Over the years we have been fortunate to achieve numerous Championship titles, Best in Show titles, Best Cat of the Year titles and many other Major titles. Breeding and Showing cats is our hobby, not a business and not for profit. We only breed a few litters each season so do not always have kittens available. There is usually a waiting list for our kittens. Imports From USA, JAPAN and EUROPE and other Australian Catteries. PLEASE NOTE: We have downsized our Cattery so will not have many kittens available due to a long waiting list. ​NO MORE KITTEN ENQUIRIES AT THIS TIME PLEASE. For information regarding these wonderful cats. and may not be copied in any manner without written permission.